We have recently added some new id tags to our site and I just wanted to take a moment to highlight one of our most requested new designs: Medical Alert id tags for pets. These tags have a shiny, silver-coloured background featuring a recessed red enamel painted design; they're both pretty and functional! The tags are available in two sizes: the large Medical Alert tag is a little bigger than a toonie and the small tag is about the size of a quarter. 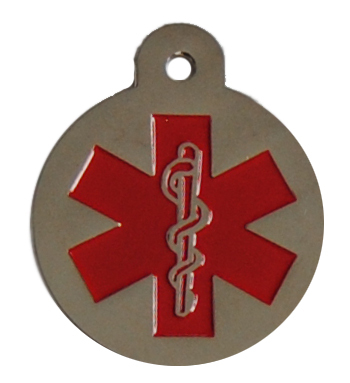 The large Medical Alert dog id tag can accommodate three lines of engraving. We suggest you include the dog's name, a contact phone number and the medical issue on the tag, however the choice is yours. The small Medical Alert tag is a great size for small dogs and cats and can fit two lines of engraving; we suggest you choose a contact phone number and the pet's health concern. The small tag could even be used in conjunction with a larger id tag to provide even more medical information about your pet. Advances in veterinary medicine mean that many of our dogs and cats happily enjoy longer lives, but some pets may cope with ongoing health concerns or need daily medication. Senior animals may have issues with sight or hearing. PetBling.ca's new Medical Alert tags are perfect for pet owners who want to signal that their dog or cat has a medical condition and needs some special TLC.